I felt like the only one of my kind in the small western Massachusetts town where I grew up. In those days being a lesbian earned you a diagnosis in the Diagnostic and Statistical Manual of Mental Disorders and the vilification of friends and family. That is why I love the fact that I now write for a lesbian press. The lesbian novels I read growing up really saved my life and helped me realize that I could survive my childhood and eventually make a life for myself. 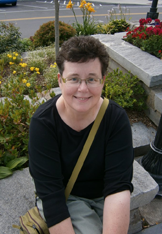 My previously published work includes essays in Eating Our Hearts Out and The Women's Times. I live in Northampton, Massachusetts, with my wife and animals. 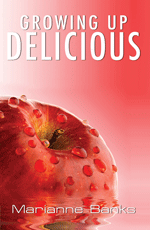 My first novel, Growing Up Delicious, took twenty-five years to write with too much time off for smoking pot, coming out of the closet and a raging case of self doubt. It wasn't until I was diagnosed with a brain tumor and had to have brain surgery that I realized to the depths of my being that I really shouldn't waste my time any longer. I will be eternally grateful to the Universe for providing me with the kick in the buttocks I needed to approach Bella Books and see if they'd give Growing Up Delicious a shot which they did in 2012. 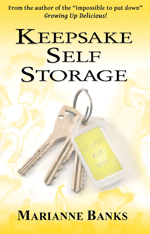 In July of 2014 they will publish my second novel, Keepsake Self Storage. I like writing stories because I like making things up. For me it really is that simple. When I was growing up there were few stories for girls like me about girls like me and I want to write some. The Golden Crown Literary Society (GCLS) is a non-profit, volunteer organization whose mission is for the education, promotion, and recognition of lesbian fiction and creative non-fiction.